General Plastics Manufacturing Company reaffirms its commitment to providing quality products to its customers with the renewal of its AS9100C certification. The culture of quality and continuous improvement in General Plastics is centered on AS9100C. General Plastics Manufacturing Company, producer of high-performance polyurethane foam and build-to-print composite parts, is pleased to announce the renewal of its AS9100 Rev C certification. The company first received its AS9100 certification in 2008. The certificate renewal demonstrates General Plastics’ continued commitment to achieve the stringent quality standards required by its aerospace customers. Sponsored by major original equipment manufacturers (OEMs), AS9100 Rev C is a global quality management system standard based on ISO 9001:2008, containing additional requirements for the aviation, space and defense industries. It provides specific requirements for quality and safety. Rev C, in particular, puts greater emphasis on a risk management system that is integrated throughout the standard. With the renewal of its AS9100C certificate, General Plastics affirms its commitment and obligation to meet customer requirements and exceed expectations. Its customers, aerospace and non-aerospace customers alike, are assured that the company has the ability to consistently produce safe and reliable products. In addition, retaining the certification shows the company’s equal emphasis on continually improving products and processes. A quality management system is in place to ensure the effectiveness of controls and processes that uphold the company to AS9100C standards. Tacoma, Washington-based General Plastics Manufacturing Company has been a leading innovator in the plastics industry for 75 years. The company develops and manufactures rigid and flexible polyurethane foam products, which include its signature LAST-A-FOAM® brand series and build-to-print composite parts. Directly or through its network of distributors, General Plastics serves the aerospace and defense, nuclear containment, composite core, prototype and modeling, construction, dimensional signage, testing, marine and the renewable energies industries. 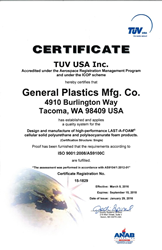 General Plastics is certified to ISO 9001:2008/AS9100C and meets the rigorous demands of numerous leading quality systems, which include NQA-1, Mil-I-45208A and Boeing Company D6-82479. Please visit http://www.generalplastics.com.